Gutter Helmet® is made from 99% recycled scrapped metal, of which 80% of the 99% is post consumer, meaning that the majority of the scrap metal used is recycled from products originally manufactured and sold to consumers in the form of products like gutters, siding, soffit, rain ware, etc. The remaining 19% is scrap generated during the manufacturing process that never makes it out our plant to the consumer market. Harvesting rainwater has long been a commercial sustainability tactic, but more recently it has attracted residential homeowners because of its abundant benefits and pending legislation in certain states focused on taxing storm water runoff. What are the benefits and what to do with the water? Rainwater that is collected on roofs and stored appropriately is a sustainable source of water for use inside and outside the home. Uses include water for gardens, irrigation, livestock, drinking water and indoor heating. 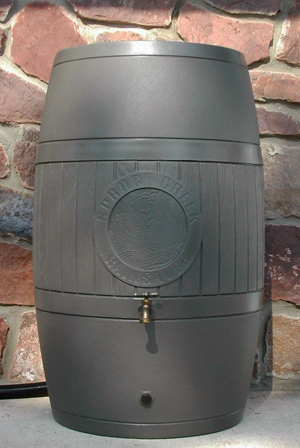 How does Gutter Helmet® improve the quality of rain barrel water? Gutter guard systems like Gutter Helmet® act as a filtration device for the water harvested via a rain barrel system. The gutter guard system filters water entering your gutters and prevents large leaves and debris from getting into the water. Without such a system in place, the water harvested via your rain barrel system will be infused with debris such as leaves. How to create your rainwater harvesting system? Creating your own rain harvesting system isn’t nearly as complicated as one might think but the one thing you must ensure is that your home is equipped with a functioning gutter system that is clear of any debris. If you have a gutter guard system like Gutter Helmet®, then the rain water entering your gutters will already be filtered of large leaves, needles and debris. Once you check that your gutter system is functional and clog-free, your first task will be to decide if you want to construct a small catchment system like a rain barrel system or if you want to construct something larger and more complex to direct the runoff water that currently flows out through your downspouts into a storage container. The sizes of these container types depend on how much rainfall your area receives, your square footage of your roof, and what you want to use the stored water for. If a rain barrel setup will be adequate for your needs, then you can purchase a 55-gallon (or larger) polyurethane or wood storage barrel, along with a spigot, some Teflon® tape, and a pipe elbow and/or small length of PVC pipe. You’ll also have to procure some sort of raised platform (concrete blocks or pavers work well for this) on which the rain barrel will be raised (note: make sure it is raised high enough to insert your watering bucket underneath). If you wish to build a larger rain harvesting system than the smaller rain barrel setup, you will most likely need to call in a professional to get all the systems integrated and working together. We recommend to our customers who are interested in a larger storage tank that they purchase from a certified retailer and installer so you can get a labor and product guarantee. Many larger tank systems exist that also combine the benefits of solar energy as well. In conclusion, a smaller catch system like a rain barrel purchased from an online retailer is probably the best choice for our DIYers out there looking for a fun weekend project. Not only will you have satisfaction in doing your part to make the world a better place but you will be satisfied to see the savings on your water bill for years to come. Enjoy and please let us know how the project goes on our Facebook page or Twitter handle, pictures are welcome!